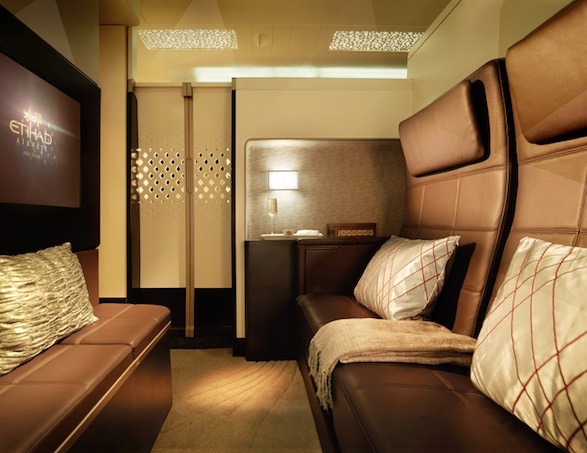 Etihad’s 1st Class for amazing miles and cash redemption. This is not a mistake fare. The availability seems to be wide open. 55,354 Etihad Guest miles + AED 80 taxes for a flight that normally runs for half a million Etihad Guest Miles is a unbelievable deal. or if you had to book it cash..
People actually pay these amounts, if only they knew better. 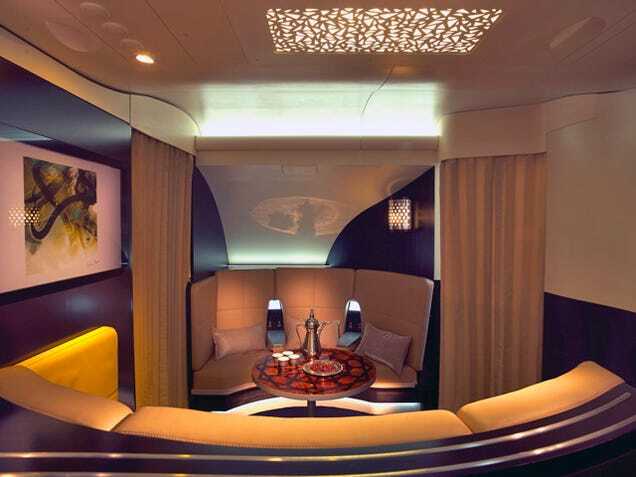 The Residence, a 3 room suite on Etihad’s flagship the A380 runs at a cool R250,000. Read more on the Residence HERE. How to get Etihad Guest miles fast. 1) Fly Etihad or their partners ( Air Seychelles, Air Berlin, Alitalia, Jet Airways etc) or credit code-share flights to Etihad Guest. 2) Book the double points / triple points / quad points when on offer. ( They often have these specials, sometimes with 3x and 4x tier miles = quicker status climbs). 3) Book using Etihad Gold membership. You earn 50% bonus miles. Etihad offers this time to time in a promotion to match any other Gold airline loyalty programme. Read more HERE. 4) Sign up with family membership. You nominate up to 9 members that will give you, the head, 100% of their miles into your account + all the bonuses above that stack. ( Emirates donates a weak 20% to head in their limit of 6x family members). 5) Book hotels with Rocketmiles ( preferably the unbranded ones that don’t carry loyalty points and perks). Rocketmiles regularly has a 3000 – 5000 bonus booking promo per stay. ( This is where you separate your stays even at one night at a time between your 9x family bonus members in point 4 above to maximise the payout). 6) You can transfer ( preferably when there is a transfer bonus) from many credit cards and other loyalty programs including hotel ones. My fave is using SPG, now Marriott Rewards that yields a 25% bonus on top, so 240k points = 100,000 Etihad Guest Miles. See Etihad partners on their website that’s often updated. 7) Once you have accumulated some miles look for the better planes in your future bookings to upgrade with, such as the B787 Dreamliner and the A380, You can even upgrade certain segments on the better planes for eg. Abu Dhabi to Mumbai is 32000 miles for a 1st class one way with 640AED tax. Upgrading from Business to 1st on this route is only 12600 miles per way with no taxes on the amazing A380. 8) Buy them. Etihad has sales on miles from times to time. Etihad also exclusively allows one to book awards using a slider to stipulate how much miles or how much taxes you would want to leverage on an award ticket. This is unique to Etihad and the taxes earns Guest Miles for your account. Win Win. This is a highly discounted way of ‘purchasing’ or ‘stretching’ miles. Check the mileage requirement for upgrades with the Mileage calculator HERE. 14 Etihad Guest miles in January. 63,000 Etihad Guest miles in February. That’s more than enough to fly Etihad 1st class paying only R250 in tax. Abu Dhabi has amazing benefits in transit for Etihad Gold members. Read a AUH transit report HERE. The closest I’ve been to Etihad’s A380 flagship. ZAR 250 for a flight that costs ZAR 77,000 – lets make it happen. Update: Read the full trip review undertaken in August 2015, HERE. Trip review: Etihad A380 First Class Apartment. Putting theory into practical is something TraveLoyalty prides itself on. I’ve documented on how to score this first class redemption for +-R250 since January 2015 in a article: Forget business class, Etihad 1st class for ZAR 250 on A380 and I also wrote: Emirates vs Etihad + 1st class suite booking for R250 in June 2015 with full disclosure how anyone could earn the miles needed through promotions in our newsletters as well as instant Etihad Gold status. I’m glad many readers took advantage of it all. Credit card statement for the bookings. I’ve spent roughly over R1060 for flights worth R308,000. Incredible value. Etihad offers complimentary chauffer services. In London they use 7 Series BMW’s. In Abu Dhabi they use Audi A6’s. Heathrow offers FASTRACK for premium ticket holders. From scanning my boarding pass in a no que line it took me 1 minute 23 seconds to have my bag scanned and I was at the duty free. The fastest I’ve clocked yet. Etihad took delivery of the A380 only in December 2014 and placed it 1st on the AUH – LHR route. You can choose your seat immediately upon booking 1st class. No need to wait 24 hours before flight departure. I will have the full review of this lounge complete with food and complimentary Six Senses Spa treatments I undertook in a future newsletter. First and Business class passengers board through the same door upstairs on the A380. There are 9x 1st class Apartments. 4x forward facing suites and 5 x rear facing suites. Forward facing suites are: 2C, 2H, 4A and 4K. Rear facing suites are: 1H, 3A, 3K, 5C and 5H. 4A and 4K have the best window views. The gourmet treat – order anything at any time. The Lobby lies between 1st and Business class on the upper deck. It seats 6 people. Travel the TraveLoyalty way. Anyone who reads the newsletters can do it. !